The African Historical Graphics Archive is designed to record, conserve and present historical maps and graphic images of Africa and its peoples for advanced scholarship, public exhibition and curriculum development on African history throughout the world. Maps of Africa and graphic images of its scenery and peoples have been produced by North Africans and Europeans ever since the work of medieval Arab geographers and the earliest contacts of the Portuguese with the West African trading kingdoms in the fifteenth century. While numerous European and American libraries and archives have rich repositories of this material for particular regions of Africa, no systematic effort has yet been made to collect, catalogue, interpret and present this material for in-depth historical scholarship, teaching and broader public appreciation. Until recently undertaking such a massive task was virtually impossible. Individual collections of rich material are so dispersed and the historical and linguistic expertise required to deal with each collection is so varied that it seemed impossible for an individual scholar to accomplish the work necessary even to begin such a project in a single life-time. Within the last decade, however, the emergence of computerized imaging technology and the associated development of online visual database software now makes it possible to build a new kind of international research facility that can coordinate and administer a multicultural, cooperative, and cumulative research project to identify, catalogue, preserve and present these priceless historical images of Africa to scholars, educators and the public at large both in America, Africa and throughout the world. The urgency for beginning this work stems from the fragile and deteriorating nature of the documents themselves. The paper upon which maps and images of Africa have been printed is in serious danger of deteriorating beyond retrieval. Unless a deliberate effort is made in a timely fashion to arrest the deterioration and engage in purposive restoration, many of the earliest and most valuable maps and images will be lost forever. Image capturing and reproduction technology make it possible to replicate the graphic images and digitally preserve them to retrieve the priceless information they contain before the originals become totally unusable. A systematic program of document recovery and restoration of this nature can be designed to serve the needs of the international scholarly community and make these invaluable primary materials available for in-depth analysis, public exhibition and distribution to participating institutions throughout the United States and around the world. From an ever expanding core of digitized documents provided by participating institutions scholars will be able to assemble and curate collections of selected original graphic material for their particular needs as part of their individual research projects. In coordination with numerous emerging third-party technologies like those that have become available through publicly accessible platforms including Google Earth, YouTube, Blurb and VoiceThread participating scholars can develop and co-publish important new studies in African history based upon this material. The interoperability of the digital collection will make it both feasible and cost-effective to produce digitally accessible textbooks, teaching materials and novel curricula for use at all levels throughout educational systems worldwide. (See, for example, "The Next Generation Of Maps" WBUR, Boston, 21 June 2012). With tools developed from the basic map archives, it would be possible for professional historians from all disciplines and area specialties around the world to start developing multi-media teaching and research facilities. Consider, for example, how a "close reading" of African maps has already stimulated important ecological research and could enhance global research immensely. In fact, examining African maps and graphics closely can lead to a new understanding of global history. The number of institutions and research centers that are developing their African maps and related historical material for public access is increasing each year. It is now possible, in principle, to create online links between these facilities. The African Historiccal Graphics Archives will devote speific attention to construct deliberate collaborative agreements with other distinguished online collections to highlight their strengths and provide increased awareness of their important resources. The NYPL Picture Collection Online – PCO. The Picture Collection Online (PCO) is a select group of images from The New York Public Library, Mid-Manhattan Library, Picture Collection. Since its creation in 1915, the Picture Collection has met the needs of New York’s large community of artists, illustrators, designers, teachers, students, and general researchers. Covering over 12,000 subjects, the Picture Collection is an extensive circulating collection and reference archive, the largest of its kind in any public library system. See, example, the PCO holdings on: African history, slavery, slave ships and the slave trade. A collaboration among the Yale University Art Gallery, the Yale University Library and Yale alumnus James J. Ross, B.A. 1960, The Ross Archive of African Images is a comprehensive database of images, representing the majority of illustrations of African objects from south of the Sahara published between 1590 and 1920 in books, periodicals, catalogues, newspapers, and other publications. The archive includes close to 5,000 images culled from public and private collections, and sheds light on how objects were used in their original contexts, such as ceremonies, shrines, village displays, and day-to-day use. It allows scholars, students, and those seeking a visual survey of African culture access to virtually every image publicly available from 1590 to 1920, along with the original accompanying text, providing an enlightening glimpse into the scholarship and attitudes of the day. Africamap is housed at the Center for Geographic Analysis at Harvard University with an initial grant from the Harvard Provosts Fund for Innovative Computing and ongoing support from the W. E. B. Du Bois Institute, the Department of African and African American Studies and the Committee for African Studies at Harvard University. AfricaMap grew out of a project, called Baobab, funded by the Seaver Institute. The David Rumsey Map Collection was started over 25 years ago and contains more than 150,000 maps. The collection focuses on rare 18th and 19th century maps of North and South America, although it also has maps of the World, Asia, Africa, Europe, and Oceania. The collection includes atlases, wall maps, globes, school geographies, pocket maps, books of exploration, maritime charts, and a variety of cartographic materials including pocket, wall, children's, and manuscript maps. Items range in date from about 1700 to 1950s. 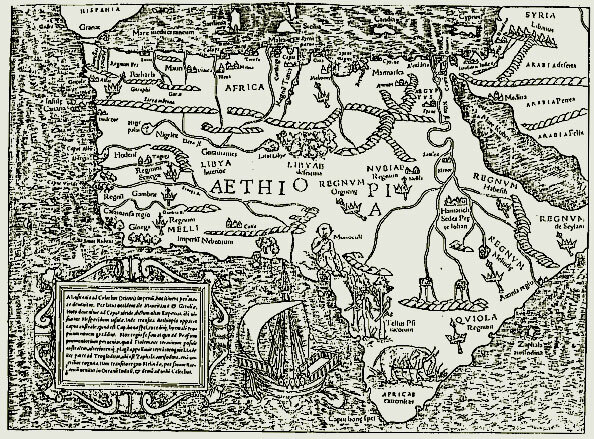 The Afriterra Foundation Afriterra The Afriterra Foundation is a non-profit Cartographic Library and Archive assembling and preserving the original rare maps of Africa in a definitive place for education and interpretation. Afriterra views cartography as a medium that uniquely links art, technology, and history, and it provides online searchable categories for its collection.